Here is the long awaited discussion about “consensus”. Note that the updates are inserted in mid April to specifically mention “Modified” Delphi and a couple other corrections. As Dr Cheryl will suggest. When she gets multiple requests for the same type of information, and it is not represented will in existing literature, it is time for a blog post and/or a video. Consensus is one of those issues. 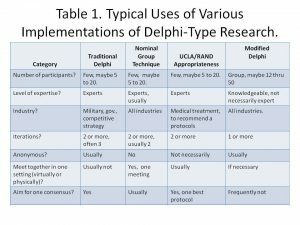 Along the same lines, is the idea of “Modified” Delphi Method. Consensus is probably the predominant reason why a study would be called “modified”. The other reason is because “informed” participants are used, not “experts”. But, that is a topic of another video/post.